Will Hydrogen Fuel Cell Cars Catch On In San Diego? Electric cars powered not by batteries but hydrogen fuel cells are poised to enter the San Diego auto market. Local government officials heard from automakers and state officials about the emerging technology, then got a chance to test drive cars at a workshop Thursday sponsored by the Center for Sustainable Energy in Kearny Mesa. Ronald Grasman from Mercedes-Benz said fuel cells, which convert hydrogen fuel and oxygen from the air into electricity, are well suited for larger vehicles. The first hydrogen stations in California are located in the Bay Area, Los Angeles and Orange County, though stations are planned for San Diego. The new vehicles are leased, with fuel included in the lease agreement. San Diego is a city of early adopters that would be a good market for the new vehicles, said Jackie Birdsall of Toyota, especially if preceded by a campaign to educate potential owners about the benefits and safety of the vehicles. “We get the Hindenburg question — the are they safe question — all the time,” she noted. The Hindenburg was a hydrogen-filled passenger blimp that caught fire over New Jersey in 1937 and is remembered because of famous news photographs. Many experts believe it was the blimp’s canvas skin, not the hydrogen, that caused the blaze. More recently, fuel cells were used to provide electric power on the Space Shuttles and Apollo spacecraft. 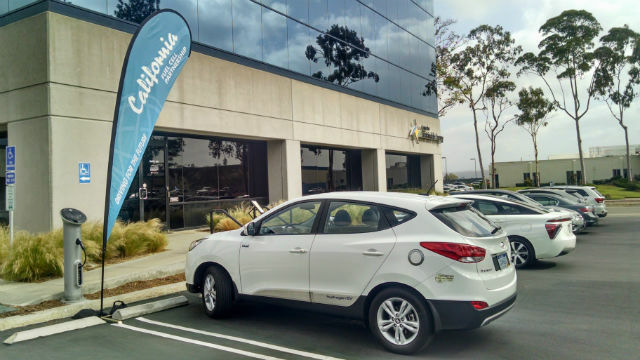 In California, the California Fuel Cell Partnership is working with manufacturers and government agencies to promote the commercialization of hydrogen fuel-cell vehicles.